An extremely rare 2200 year old gold coin, minted in Alexandria by King Ptolemy V Epiphanes was uncovered at Tel Kedesh, near Israel’s border with Lebanon. The head of the Coin Department of the Israel Antiquities Association, Dr. Ariel, said, “This is the heaviest (27.7 grams compared to most ancient gold coins that weight 4.5 grams) and hence most valuable ancient gold coin ever found in an excavation in Israel. The coin depicts a queen, believed to be Arsinoe II Philadelphus, who was married to her half-brother Ptolemy II. It is possible, however, that it may actually be Ptolemy V’s wife Cleopatra I, daughter of Antiochus III.” First Book of the Maccabees (vii. 6) and Josephus devote considerable attention to Antiochus III since it was through him that Judea’s long and peaceful quietude amid constant warfare all around was interrupted. A half shekel coin was found in the drainage channel of the Second Temple period road leading from the Siloam Pool to the Temple Mount. The coin was used to pay the annual head tax as commanded in the Bible. The shekel that was found in the excavation weighs 13 grams, bears the head of Melqart, the chief deity of the city of Tyre on the obverse (equivalent to the Semitic god Baal) and an eagle on the prow of a ship on the reverse. The coin was minted in the year 22 CE. A silver half shekel coin was discovered in the rubble from the Temple Mount dumped by the Waqf in the Kidron Valley and being sifted at Emeq Tsurim. 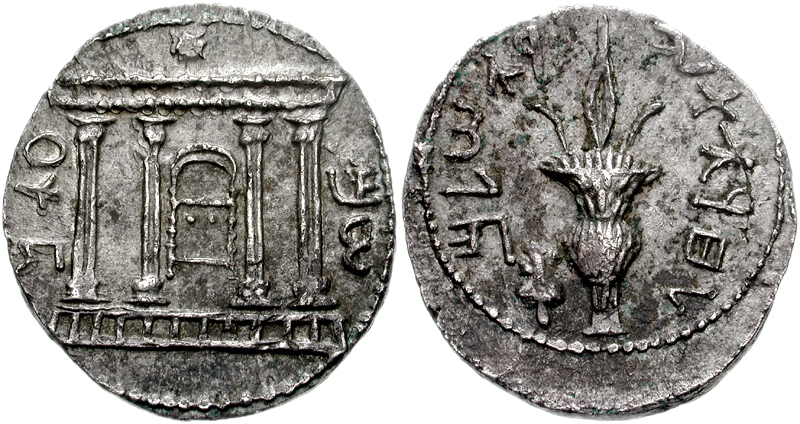 On one side of the coin, a branch with three pomegranates is visible with the inscription “Holy Jerusalem.” The other side of the coin bears a chalice from the First Temple and says “Half Shekel.” During the days of the Great Revolt, they replaced the Tyrian shekels for the head tax. The coin was minted in the first year of the Great Revolt against the Romans 66 BCE. A coin minted by the Greek ruler Antiochus Epiphanes IV (175-163 BCE) of the Chanukah story was discovered in the rubble dumped in the Kidron valley from the Temple Mount. A gold coin from Napoleon III was discovered in the rubble. In total, some 3500 coins have been found by the Emeq Tsurim Sifting Project. To listen to an interview that I did with IsraelSeen click here. A hoard of 264 gold coins from the Byzantine period (4th-6thC CE) were found in the excavations in the Givati parking lot across from Ir David. All the coins are identical, with the likeness of the emperor Heraclius (610-641CE) wearing military garb and holding a cross in his right hand on the obverse, with the sign of the cross on the reverse. These coins were minted at the beginning of Heraclius’ reign (between the years 610-613 CE), one year before the Persians conquered Byzantine Jerusalem in 614 CE. A rare Crusader minted coin has been identified, after it was recently found in excavations in the Jaffa Flea market. The find, a rare Frankish silver half drachma, is the first specimen to come from a controlled excavation. It was minted only during a very brief period in Frankish Acre, between 1251 and 1257, and was discovered in a domestic structure dating to the 13th century with ceramics dating to the same period. Interestingly, the coin imitates the half dirhem struck in Damascus by the Ayyubids during the first half of the 13th century. In 1250 Bishop Eudes de Chateauroux, learning that the Franks were minting imitation coins with Muslim themes (name of Muhammad and his birth date) ordered an end to the practice, requesting the personal intervention of the Pope Innocent IV. This entry was posted in Archaeology, Jerusalem and tagged coin, discovery, gold, numismatic, shekel, Sifting project, Temple Mount on November 15, 2010 by Shmuel Browns.